I've about caught up on the computer re-build. Just waiting on a replacement disk for one program. There is evidence that I had the disk. I have the installation manual, but the computer is one of many things that got moved during the" great house remodel." The disk should have been in the drawer with all the other program disks, but it isn't there. I've never done anything like this before, and I feel so empowered. I have, of course, installed programs. All of the important programs have been restored. If something is missing now, I can download it for free. The expensive software is working. I'm still getting used to a Microsoft Office update, long needed. The disks were in the house, but not on my machine before its stroke. There are things I like about the newer version (2007), and others I'm not sure about. I had to put together a handout for a class I'm teaching Saturday on reversible cables. 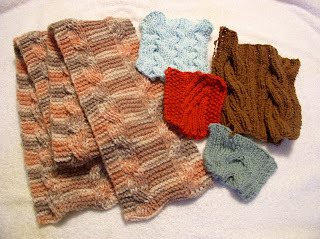 I had done the research and knit the samples. I hope the patterns I wrote for the swatches make sense. A lot of other knitting has happened. I knit up the vest "kit" I bought in Tallahassee. I knew that project would be done quickly so that I could wear it. DD Joyce and I split a bag of yarn, thinking we both would make the same pattern. She changed her mind! 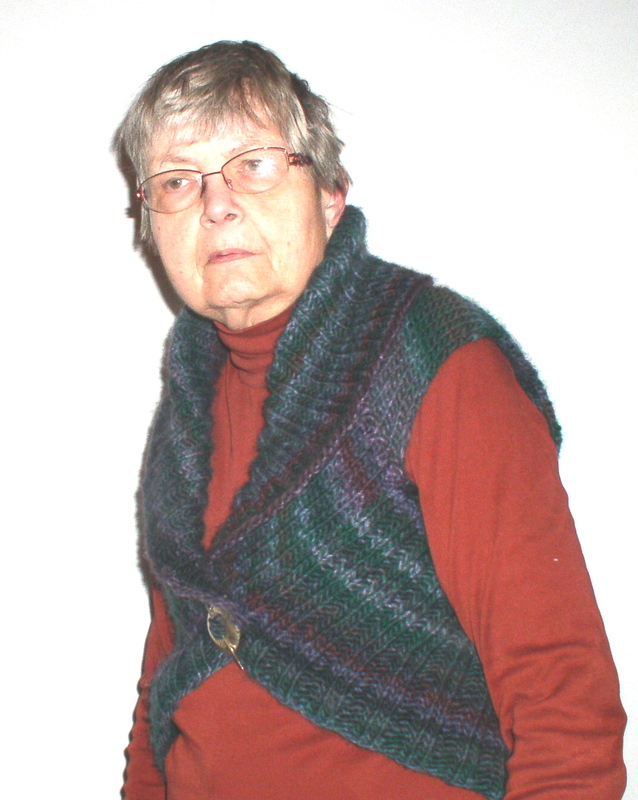 I have this comfy vest made form Austermann Murano, a bulky yarn. It's hard for me to say if it is flattering on me, but I love it anyway. I just don't like that I look like an old lady. Self timer on the camera may not be the best way to go here. Last summer I started a baby blanket. A group at my church was doing them for charity. The group stopped meeting for knitting and the blanket sat. It is now done and will go to some baby at some time. 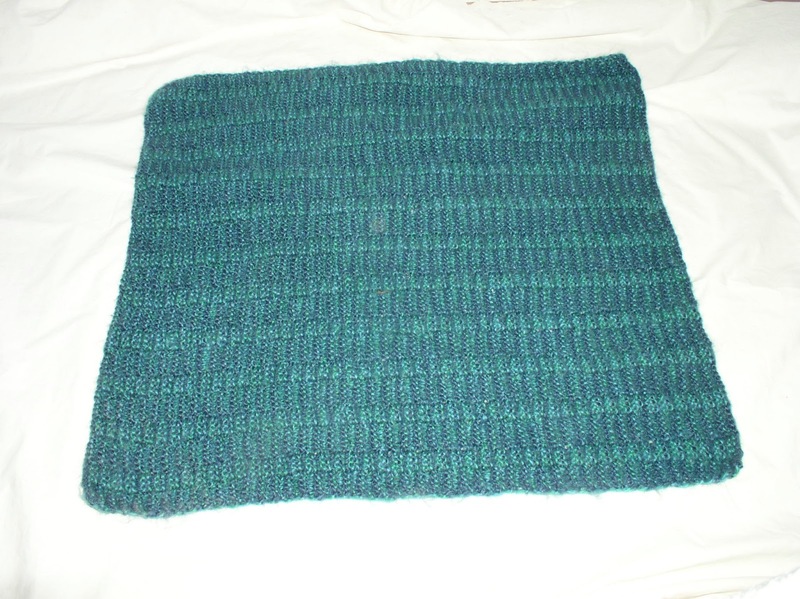 It is too small for the charities my knitting guild supports, but would be fine for a stroller or car seat. I used some cone yarn that was in my stash. In the "Oh No" department, I decided to knit a hat for great granddaughter Rayven. She turned four. Got some stash yarn and cast on. I realized that the hat would fit me, but I finished it up anyway. There was enough yarn for a proper size hat.The larger hat went to my DDIL Peg, who had her head shaved for charity. I took a picture with my phone iof her wearing the hat, but It is upside down when viewed on the pc. So frustrating. DD Joyce had a birthday this week, and is a big Dr. Who fan. 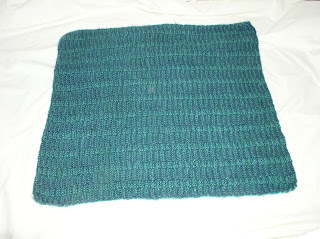 I had to knit the scarf from Knitty.com called Bigger on the Inside. It's hard to see, but there are fifteen iterations of the TARDIS on the lower border. I called them "Tardi" although there is no plural for something that is unique. I even used the yarn suggested in the pattern, Lorna's Laces Solemate. I have enough left over for a pair of socks, a bonus I hadn't counted on. The first 100 gm knit all the lace and all the Tardi. It's back in the stash until it tells me what it wants to be. 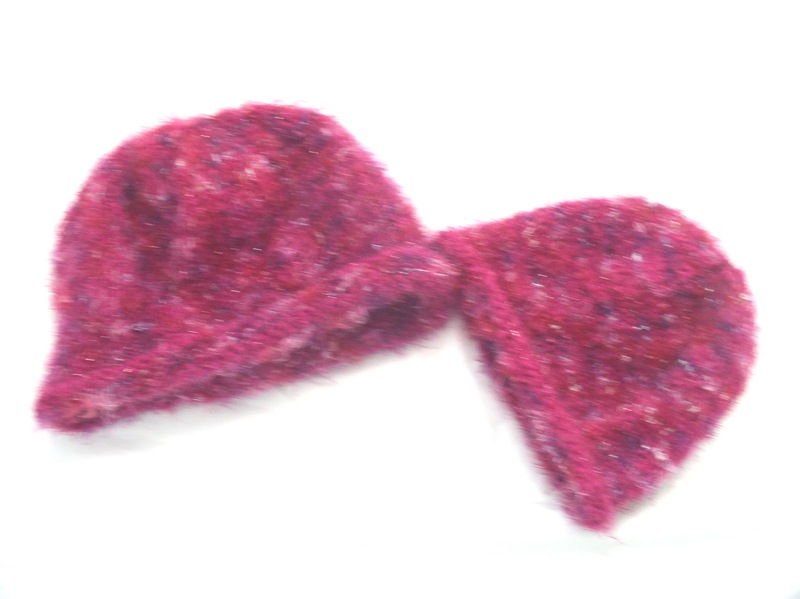 Since DDIL Peg got a fuzzy hat to keep her bald head warm, her daughter needed one too. She also got bald for St. Baldrick's to support children's cancer. Her favorite color is black for clothes.There was some WoolEase and fun fur in my stash. 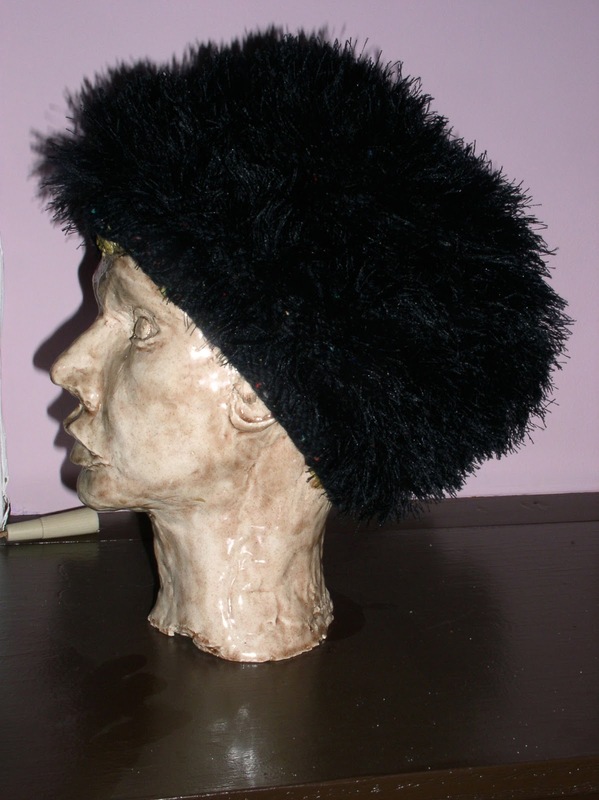 the result is very soft, but I had to buy more fun fur to finish the hat. I also knit a bulky sweater. You won't see a picture or it, as it went in the trash. There were some problems with the free pattern, and problems with the yarn. The final straw was when the yarn relaxed considerably when washed. It went from a size medium to a XL tall. It just wasn't worth trying to fix. At least I have the yarn out of stash. All of it was inherited from my mom, so I didn't pay for it. It's getting a little easier to get rid of things that aren't working, but I grew up saving everything, because you might need it some day. I'm trying to leave less for my kids to dispose of when I'm gone, but it's a struggle! It doesn't help that there's so much that I'm actually using.